In a way, it could be regarded as symbolic. 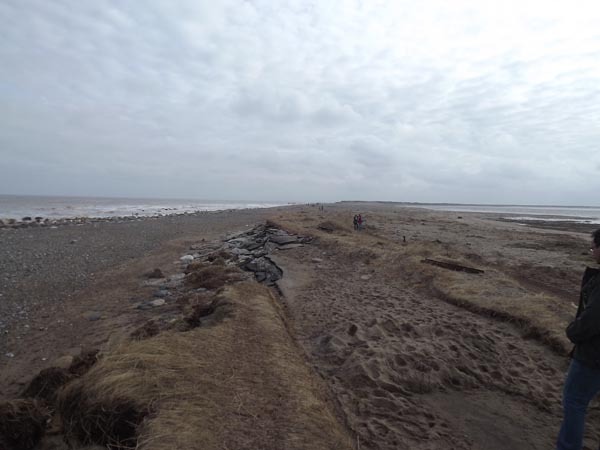 The picture shows what is left of the road to the eastern-most tip of England – Spurn Point – from which the coastguard station watches the traffic out of the Humber, ships on their way down the North Sea to ports on the continent. The storms of the winter before last have washed away the road, leaving the link broken. A relatively small amount of money would repair the road, but such are the encroaching seas that, as fast as the link is repaired, the winter high tides wash it away again. All that is left is a German-built Unimog truck to shuttle visitors down to the point at low tide – perhaps another symbol, although I would hesitate to offer an interpretation. Nevertheless, Spurn Point is the place to be to "celebrate" Brexit, whenever that actually happens. We might even take it as the end of the transition period: midnight, 31 December 2020, when the ties are fully broken and the sea of Brexit washes away the link. This is the place where we will see, in a negative sense, the evidence of Brexit. Standing on Spurn Point, one can normally see a procession of specialist chemical tankers on their way from Goole to Rotterdam, and back. But, as I pointed out in my post on REACH, published on 28 January 2017, after Brexit proper, we will no longer see these ships (for a while, at least) if trade in chemicals with the continent dries up. It really is quite remarkable how difficult it is for the chatterati to take on board this simple point, but the fact is that, once the transition period is over, UK manufactured chemicals, which have been registered by the manufacturers under the REACH regulation, will no longer be accepted in the EEA for free circulation. At great cost, the 6,000 or so chemicals registered in the UK will have to be re-registered by a representative established in the territory of an EU Member States, or the registrations will have to be transferred to an EU entity. Products cannot be traded in the EEA until this is done. Oddly, the EU has been less than forthcoming on the impact of Brexit on chemical industries, with the European Chemical Agency archly observing that: "If your business is in any way part of a supply chain that links you to businesses located within the 27 EU Member States remaining after the UK's withdrawal, you will face some fundamental changes". For details of those "fundamental changes", it refers businesses to a Notice to Stakeholders on the "withdrawal of the United Kingdom and EU rules in the field of industrial products". In this generic document, though, there is no specific mention of chemicals, the examples given relating to medical devices, transportable pressure equipment, marine equipment and cosmetic products. Nonetheless, what applies to these sectors in terms of appointing representatives also applies to chemical products. It is in this Notice to Stakeholders that we also get some details on the fate of UK Notified Bodies. These, we are told, will be removed from the Commission's information system on notified organisations – the so-called NANDO databases. As such, the Commission says, "UK bodies will not be in a position to perform conformity assessment tasks pursuant to Union product legislation as from the withdrawal date". Where third party certification of products is required under EU law, UK suppliers (known in the jargon as "economic operators") are "advised" to consider either applying for a new certificate issued by an EU-27 Notified Body or arranging for a transfer to an EU-27 Notified Body, which would then take over the responsibility for that certificate. What I have not done to date on this blog is set out in detail the products and sectors that will be caught by this requirement. And the very simple reason for this is that it is a very long list. But, if you want it, here goes – pared down to the absolute essentials. It takes in: products within the scope the 2001 general product safety directive; certain hazardous substances in electrical and electronic equipment; disposal of waste electrical and electronic equipment; batteries and the disposal of waste batteries; appliances burning gaseous fuels; ecodesign requirements for energy-related products; simple pressure vessels; toy safety; electrical equipment designed for use within certain voltage limits; dangerous machinery; electromagnetic compatibility; measuring instruments; non-automatic weighing instruments; cableway installations designed to carry persons; and radio equipment. Then there are medical devices and active implantable medical devices; in vitro diagnostic medical devices; cosmetics; pressure equipment; transportable pressure equipment; aerosol dispensers; lifts and safety components for lifts; recreational craft and personal watercraft; equipment and protective systems intended for use in potentially explosive atmospheres; explosives for civil uses; construction products; pyrotechnics; regulation on the labelling of tyres; personal protective equipment and marine equipment. Although by now, you might be feeling a tad overwhelmed, there is still much more to do. We have noise emission in the environment by equipment for use outdoors; energy labelling; textile fibre names and related labelling and marking of textile products; labelling of the materials used in the main components of footwear; metrology; bottles as measuring containers; making up of pre-packaged products, hot-water boilers fired with liquid or gaseous fuels; interoperability of the rail system within the European Union; interoperability of electronic road toll systems; tachographs in road transport and interoperability of the European Air Traffic Management network. As always, the devil is in the detail and this is just a bare-bones outline that needs expanding before it makes any real sense. The specific applications will have to be explored and the relevant businesses notified of any impending changes of rules – bearing in mind that we may be able to negotiate mutual recognition agreements on conformity assessment, covering some products (but not necessarily all). Of course, standing on Spurn Point on Brexit day will not reveal any of this. People will have to exert themselves and find out about such things for themselves. And certainly, no one can complain that they weren't told about the basics. They are all there in the Notice to Stakeholders. But finding out for ourselves, it seems, it not the way we do things in this country any more – if we ever did. We have to wait until some official body or a person of High Prestige, tells us what to be concerned about – what to think. And unless we are spoon-fed in such as way, we are content with our own ignorance, and even revel in it. What is fascinating here is that knowledge is of no value and is not at all highly regarded. What matters, as the Observer reported yesterday, is a "handle" which gives privileged access to ministers – who will then believe virtually everything they are told from such sources. This is the newspaper catching up with Legatum, the supposedly "libertarian" think tank and advocate of a hard Brexit. Although we wrote about it eight months ago, only now are we being told that concerns that it "is playing a behind-the-scenes role in shaping Britain’s future trade policy" have been heightened after claims that "it has enjoyed greater private access to trade ministers and civil servants than any other body". But this comes just at a time when Snake Oil Singham and his team have decanted from Legatum to the serially incompetent IEA, beneficiary of undisclosed funds directed at securing a regulation-free nirvana of chlorinated chickens and arsenic in unregulated cosmetics. The way things are going, though, we'll probably be seeing an extension to the transition period, so it may be a long time before I'm back at Spurn Point to look for ships that don't pass in the night. But, when the ships do stop sailing we will be able to get some small entertainment from listening to the expressions of shock and outbreak from those who should have known, but couldn't be bothered to find out. To avoid that, those who depend on such things for their living, though, had better start stocking up. Otherwise, the only thing in surplus will be snake oil and ignorance.